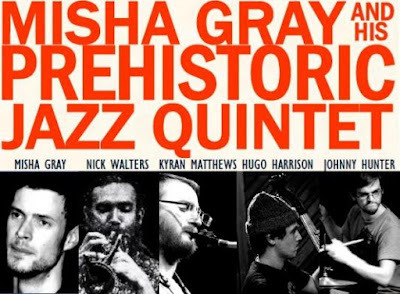 Ribble Valley Jazz and Blues Club continue their varied and exciting monthly gig programme on Friday 7th April with Misha Gray and his Prehistoric Jazz Quintet. The Manchester jazz scene is teeming with exciting musicians and ensembles at the moment! Line-up: Nick Walters - trumpet, Kyran Matthews - saxophone, Misha Gray - piano, Hugo Harrison - bass, Johnny Hunter - drums. For more information on the band and Misha's other groups, visit the Misha Gray website. Head to the Ribble Valley Jazz Club website for more information on their monthly programme and festival.